(CN) – Unmitigated climate change could increase income inequality in the United States, as new research projects poor states will face severe economic damage, while richer areas could actually stand to benefit. The poorest third of counties could pay as much as 20 percent of their total income if warming is not curbed, according to a study published Thursday in the journal Science. 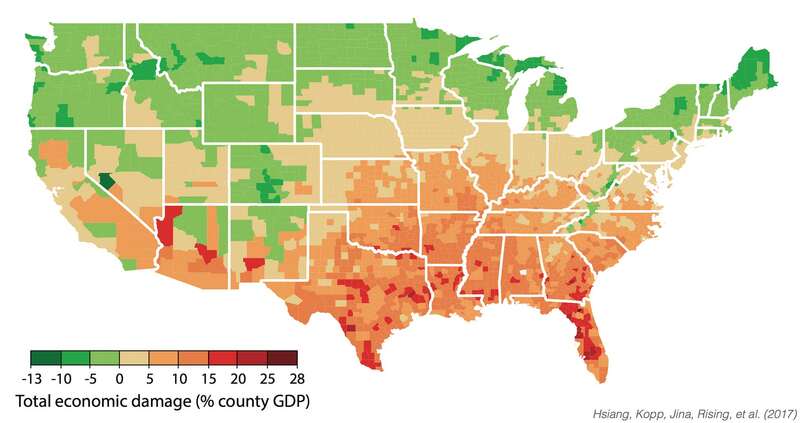 States in the South and lower Midwest – areas that already tend to be poor and hot – will lose the most, with economic opportunity migrating northward and westward. In contrast, the research projects that colder and richer counties in the Rockies and along the northern border will experience improvements in health, energy costs and agricultural production. In order to measure the potential financial consequences if current warming trends continue, the researchers used 116 climate projections and state-of-the-art statistical methods to determine how rising seas, changing rainfall, higher temperatures and intensifying hurricanes could affect coastal communities, crime, agriculture and other real-world factors. If greenhouse gas emissions are not slowed, the resulting 6 to 10 degrees Fahrenheit of warming above 19th century levels projected for the last two decades of this century will produce economic challenges on par with the Great Recession, according to the research. Based on the data, the team estimates that for each 1 degree Fahrenheit increase in global temperatures, the U.S. economy loses about 0.7 percent of its gross domestic product – the total value of goods produced and services provided in a given nation each year – with each degree of warming costing more. Co-author James Rising, a postdoctoral fellow at UC Berkeley, credited the team’s findings to recent developments within big data and computing.